Builder Board Tape Dispener will save time and money by taping faster than ever! Load, unwind and GO! Move heavy furniture easily and without damage to hard surface floors with Hard Surface Sleds. 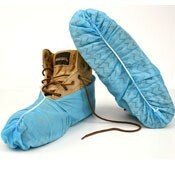 Protect your new floors and shoes with these Non-Slip Cloth Boot Protectors. Secure flooring protection to the floor with this clean removal tape. This blue painters tape is a clean removal tape, and will not leave a sticky residue. Surface Shields painters masking tape is UV resistant. Let vapors escape by seaming Builder Board with this breathable tape. This strong, flexible floor protection tape lays flat and prevents cure lines. Sold in a 3 inch wide x 36 yard roll. Apply Johnsonite Cove Base with power tape. Quick, easy, and clean. 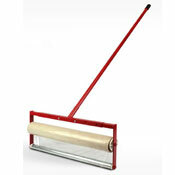 Hand-Saver carpet mask hand rollers make installing carpet masking and floor cover a breeze. NEW!It is now easier to use the 36"x500' and 48" carpet protection rolls by applying it with this 48" stand up roller. Create a dust containment system at you job site to prevent dust and debris from getting in your workspace. These aluminum heavy gauge barrier poles extend up to 144 inches and have a swiveling foot which will grip to straight or angled ceilings. Kraft Shield floor protection paper is a dependable solution to protect flooring and cabinets from paint and spills. This brown kraft paper is a preferred alternative to red rosing paper. Sold in a 35 inch x 144 foot roll. Create an instant doorway when using plastic zipper strips at your construction site. This Zip N Close product comes with two zippers that are 1.5 inches wide by 7 feet high. Easy use of kraft paper combined with the protection against water and other liquids, makes the Water Shield construction floor protection a must have. This heavy-duty water resistant kraft paper does not tear under normal site traffic. Water Shield is sold in 36 inch wide x 300 foot length rolls. NEW Pricing! 24" x 200' - Made in the USA. This carpet shield is a clear floor covering that can be left down 50% longer than other leading brands. Tough, 3 mils thick carpet protector. Reverse Wound carpet shield. NEW! Longest lasting floor protection film of the industry. Made to stand up to traffic, 50% thicker than other brands. Regular Wound floor shield. Not for use on site finished floors. NEW Pricing! Save 8.8% Longest lasting floor protection film of the industry. Made to stand up to traffic, 50% thicker than other brands. Reverse Wound Not for use on site finished floors. NEW Pricing! Save 4.2% Made in the USA. Clean release for easy removal without adhesive transfer. 50% thicker for added protection. Reverse Wound floor shield. Do not use this on site finished floors. 30" x 200' - Clear film carpet protection for stairways, hallways, and more. 3 mils thick! Carpet film protector is durable and will save you time and money. Regular Wound stair carpet protection film. Made in USA. Neo Shield Re-Usable Flooring Protection. Tough surface protection for hardwood, linoleum, ceramic tile, and carpeted surfaces. New! Builder Board floor protection. Great for construction jobs. NEW Pricing! Save 12.1%! 36" x 200' - Protect new carpet with this clear plastic, 3 mils thick, carpet masking film. This carpet film is durable and will save you clean up and repairs. Reverse Wound carpet protection film. Made in the USA. NEW Pricing! Save 7.6%! 36" x 500' - Carpet shield brand contractor protection will protect carpets. 3 mils thick for tough floor protection! Carpet mask in made in the USA. Reverse Wound carpet shield. NEW Pricing! Save 4.5%! 48" x 500' - This clear plastic carpet protection film is 3 mils thick and can stay down 50% longer than leading brands. Temporary carpet protection is ideal for commercial and residential use. Reverse Wound carpet film. Made in the USA. Pro-Shield Floor Protection - Not just for floors. Also use on counters, sinks, and tubs. 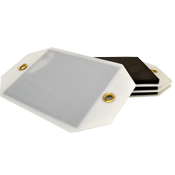 Adhesive clean mat stops dirt from being tracked into your office or home during construction or remodeling jobs. NEW Pricing! Save 12.9%! Adjustable carpet masking roller for easy installation of 24", 30" and 36" carpet protection film or hard surface film.